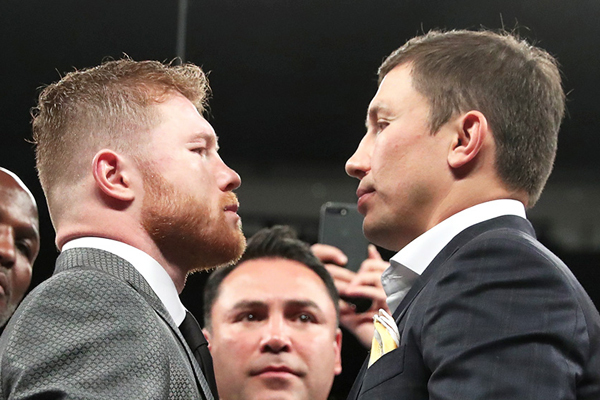 This Saturday night in Las Vegas, Saul Alvarez will face the toughest opponent of his career, when he climbs into the ring with middleweight wrecking ball Gennady Golovkin. But Canelo has been no stranger to major fights. He has been a professional fighter since age 15. He has been a star since before he was old enough to drink. Shane Mosley: May 5, 2012 Let’s be clear–Canelo beat a badly aged version of Shane Mosely in this bout. And as a former lightweight, Mosley was the much smaller man. Still, this was the win that gave Alvarez his first Hall of Fame scalp. Austin Trout: April 20, 2013 Trout was coming off from a brilliant win over Miguel Cotto when Alvarez fought him in 2013. They were the two top fighters in the world at super welterweight, so the win made Canelo a true world champion. Judge Stanley Christodolou scored 118-109 for Alvarez–he must have filled it out in the hotel room the night before the fight. This was a very close bout. Canelo had real problems with Trout’s movement. I thought the fight was even, with Alvarez winning due to a Round 7 knockdown. Floyd Mayweather: September 14, 2013 Alvarez took a huge step up in competition and lost a very one-sided, low-action fight to the pound-for-pound king. This was the fight that forever ruined the reputation of judge C.J. Ross, who somehow saw the fight as a draw. She was laughed out of the sport and hasn’t judged since. Erislandy Lara: July 12, 2014I am hardly alone in feeling that Alvarez should have lost this fight–although it was unquestionably a close bout and I would not call it a robbery. Lara clearly did not like Alvarez’s body work and spent long moments of the fight avoiding contact. November 11, 2015 The biggest recent fight in the great Mexico-Puerto Rico rivalry, Alvarez was simply too big and too young for Cotto. Cotto complained afterward that he had been robbed, but that is delusional. Alvarez won eight rounds of this bout at an absolute minimum. The victory made him the lineal middleweight champion and made a showdown with Golovkin inevitable.